^ "Hydrogen Cyanide - Compound Summary". PubChem Compound. USA: National Center for Biotechnology Information. 16 September 2004. Identification. Retrieved 2012-06-04. ^ Perrin, D. D. (1982). Ionisation Constants of Inorganic Acids and Bases in Aqueous Solution (2nd ed.). Oxford: Pergamon Press. ^ Patnaik, P. (2002). Handbook of Inorganic Chemicals. McGraw-Hill. ^ "Cyanide, inability to smell". ^ Lytle, Thomas. "Poison Harpoons". Retrieved 28 October 2013. Carl W. Scheele (1782) "Försök, beträffande det färgande ämnet uti Berlinerblå" (Experiment concerning the coloring substance in Berlin blue), Kungliga Svenska Vetenskapsakademiens handlingar (Royal Swedish Academy of Science's Proceedings), 3: 264-275 (in Swedish). ^ Andrussow, L. (1935). "The catalytic oxydation of ammonia-methane-mixtures to hydrogen cyanide". ^ Endter, F. (1958). "Die technische Synthese von Cyanwasserstoff aus Methan und Ammoniak ohne Zusatz von Sauerstoff". Chemie Ingenieur Technik 30 (5): 305–310. ^ Vetter, J. (2000). "Plant cyanogenic glycosides". Toxicon 38 (1): 11–36. ^ Jones, D. A. (1998). "Why are so many food plants cyanogenic?". ^ "Are Apple Cores Poisonous? The Naked Scientists September 2010". Retrieved 6 March 2014. ^ Blum, M. S.; Woodring, J. P. (1962). "Secretion of Benzaldehyde and Hydrogen Cyanide by the Millipede Pachydesmus crassicutis (Wood)". ^ Aregheore, E. M.; Agunbiade, O. O. (1991). "The toxic effects of cassava (manihot esculenta grantz) diets on humans: a review". Veterinary and Human Toxicology 33 (3): 274–275. ^ White, W. L. B.; Arias-Garzon, D. I.; McMahon, J. M.; Sayre, R. T. (1998). "Cyanogenesis in Cassava, The Role of Hydroxynitrile Lyase in Root Cyanide Production". ^ Matthews, C. N. (2004). "The HCN World: Establishing Protein - Nucleic Acid Life via Hydrogen Cyanide Polymers". Origins: Genesis, Evolution and Diversity of Life. Cellular Origin and Life in Extreme Habitats and Astrobiology 6. pp. 121–135. ^ Al-Azmi, A.; Elassar, A.-Z. A.; Booth, B. L. (2003). "The Chemistry of Diaminomaleonitrile and its Utility in Heterocyclic Synthesis". Tetrahedron 59 (16): 2749–2763. ^ a b Snyder, L. E.; Buhl, D. (1971). "Observations of Radio Emission from Interstellar Hydrogen Cyanide" (pdf). Astrophysical Journal 163: L47–L52. ^ Treffers, R.; Larson, H. P.; Fink, U.; Gautier, T. N. (1978). "Upper limits to trace constituents in Jupiter's atmosphere from an analysis of its 5-μm spectrum". Icarus 34 (2): 331–343. ^ Bieging, J. H.; Shaked, S.; Gensheimer, P. D. (2000). "Submillimeter‐ and Millimeter‐Wavelength Observations of SiO and HCN in Circumstellar Envelopes of AGB Stars" (pdf). Astrophysical Journal 543 (2): 897–921. ^ Schilke, P.; Menten, K. M. (2003). "Detection of a Second, Strong Sub-millimeter HCN Laser Line toward Carbon Stars" (pdf). Astrophysical Journal 583 (1): 446–450. ^ a b Boger, G. I.; Sternberg, A. (2005). "CN and HCN in Dense Interstellar Clouds" (pdf). Astrophysical Journal 632 (1): 302–315. ^ Gao, Y.; Solomon, P. M. (2004). "The Star Formation Rate and Dense Molecular Gas in Galaxies" (pdf). Astrophysical Journal 606 (1): 271–290. ^ Gao, Y.; Solomon, P. M. (2004). "HCN Survey of Normal Spiral, Infrared‐luminous, and Ultraluminous Galaxies" (pdf). Astrophysical Journal Supplements 152: 63–80. ^ Wu, J.; Evans, N. J. (2003). "Indications of Inflow Motions in Regions Forming Massive Stars" (pdf). Astrophysical Journal 592 (2): L79–L82. ^ Loenen, A. F. (2007). Proceedings IAU Symposium 202. ^ Zubritsky, Elizabeth; Neal-Jones, Nancy (11 August 2014). "RELEASE 14-038 - NASA’s 3-D Study of Comets Reveals Chemical Factory at Work". ^ Cordiner, M.A. et al. (11 August 2014). "Mapping the Release of Volatiles in the Inner Comae of Comets C/2012 F6 (Lemmon) and C/2012 S1 (ISON) Using the Atacama Large Millimeter/Submillimeter Array". ^ Poison Hand Darted Harpoons and Lances. ^ The Poison Garden website http://www.thepoisongarden.co.uk/atoz/prunus_laurocerasus.htm . Retrieved 18 October 2014. Under the name prussic acid, HCN has been used as a killing agent in whaling harpoons. From the mid 18th century it was used in a number of poisoning murders and suicides. Cyanide has also been used in major occurrences of suicide in the 20th century, including the deaths of over 900 people at Jonestown and the mass suicides in 1945 Nazi Germany. Hydrogen cyanide is commonly listed amongst First World War, the United States and Italy used hydrogen cyanide against the Central Powers in 1918. France had used it in combat already in 1916, but this proved to be ineffective due to physical conditions. Hydrogen cyanide has been absorbed into a carrier for use as a pesticide. Under IG Farben's brand name Zyklon B (German >Cyclone B, with the B standing for Blausäure - "Prussic Acid"), it was used in the German concentration camp mass killing during World War II. The same product is currently made in the Czech Republic under the trademark "Uragan D2". Hydrogen cyanide was also the agent employed in judicial execution in some U.S. states, where it was produced during the execution by the action of sulfuric acid on an egg-sized mass of potassium cyanide. A hydrogen cyanide concentration of 300 mg/m3 in air will kill a human within 10–60 minutes. A hydrogen cyanide concentration of 3500 ppm (about 3200 mg/m3) will kill a human in about 1 minute. The toxicity is caused by the cyanide ion, which halts cellular respiration by acting as a non-competitive inhibitor for an enzyme in mitochondria called cytochrome c oxidase. Specifically CN- binds to Fe in the heme subunit in cytochromes, interrupting electron transfer. HCN has been detected in the interstellar medium. Since then, extensive studies have probed formation and destruction pathways of HCN in various environments and examined its use as a tracer for a variety of astronomical species and processes. HCN can be observed from ground-based telescopes through a number of atmospheric windows. The J=1→0, J=3→2, J= 4→3, and J=10→9 pure rotational transitions have all been observed. HCN is the precursor to monomer methyl methacrylate, from acetone, the amino acid methionine, via the Strecker synthesis, and the chelating agents EDTA and NTA. 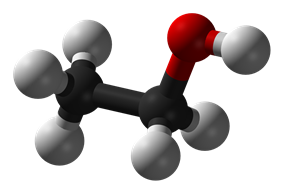 Via the hydrocyanation process, HCN is added to butadiene to give adiponitrile, a precursor to Nylon 66. The demand for cyanides for mining operations in the 1890s was met by ammonia over glowing coal in 1892. This method was used until Hamilton Castner in 1894 developed a synthesis starting from coal, ammonia, and sodium yielding sodium cyanide, which reacts with acid to form gaseous HCN. In 1787 the French chemist Claude Louis Berthollet showed that Prussic acid did not contain oxygen, an important contribution to acid theory, which had thitherto postulated that acids must contain oxygen (hence the name of oxygen itself, which is derived from Greek elements that mean "acid-former" and are likewise calqued into German as Sauerstoff). In 1811 Joseph Louis Gay-Lussac prepared pure, liquified hydrogen cyanide. In 1815 Gay-Lussac deduced Prussic acid's chemical formula. The radical cyanide in hydrogen cyanide was given its name from cyan, not only an English word for a shade of blue but the Greek word for blue (Ancient Greek: κυανοῦς), again owing to its derivation from Prussian blue. Hydrogen cyanide was first isolated from a blue pigment (Prussian blue) which had been known from 1704 but whose structure was unknown. 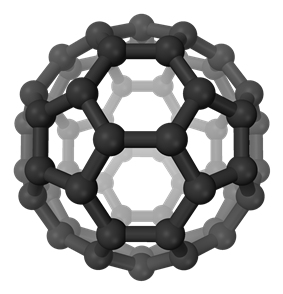 It is now known to be a coordination polymer with a complex structure and an empirical formula of hydrated ferric ferrocyanide. In 1752, the French chemist Pierre Macquer made the important step of showing that Prussian blue could be converted to iron oxide plus a volatile component and that these could be used to reconstitute it. The new component was what we now know as hydrogen cyanide. Following Macquer's lead, it was first prepared from Prussian blue by the Swedish chemist Carl Wilhelm Scheele in 1782, and was eventually given the German name Blausäure (lit. "Blue acid") because of its acidic nature in water and its derivation from Prussian blue. In English it became known popularly as Prussic acid. HCN has a faint bitter almond-like odor that some people are unable to detect owing to a genetic trait. The volatile compound has been used as inhalation rodenticide and human poison, as well as for killing whales. Cyanide ions interfere with iron-containing respiratory enzymes. Hydrogen cyanide is weakly acidic with a pKa of 9.2. It partially ionizes in water solution to give the cyanide anion, CN–. 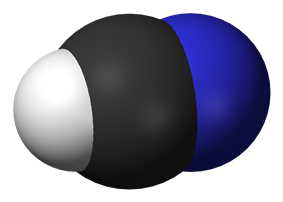 A solution of hydrogen cyanide in water, represented as HCN, is called hydrocyanic acid. The salts of the cyanide anion are known as cyanides.